Just when you think the world has received the fanciest smartphone, another flashy gadget is launched. 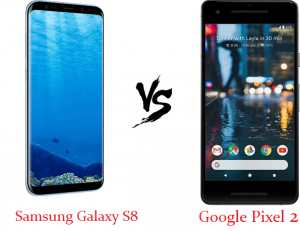 In the world of Androids, there are numerous devices sold in shops across the globe but only a few compare to the Samsung Galaxy S8 and Google Pixel 2. Compared to the fancy, sleek, and thin appearance of the S8, the Pixel 2 sports a simple and sleek look without the presence of a large screen in contrast with the body or a curved-edged screen display. Both devices have a fingerprint scanner but their position differs: the S8 has one is situated next to it’s hind camera while Pixel 2 is centrally placed and easy to reach. Additionally, the Galaxy S8 comes with a heart rate scanner at the back and an iris ID on the front. Though both gadgets are water and dust resistant, the S8 is superior since it has an IP68 rating against the IP67 sported with the Pixel 2. Instead of a headphone jack, Google fitted their product with a wireless codec for audio accompanied by dual front speakers for external purposes. Besides, a dongle can be used in place of earphone jack. Samsung takes the trophy for an impeccable 5.8 super AMOLED display with an exquisite resolution of 2960×1440. On top of that, it is fitted with about 570 pixels in density per inch. On the contrary, Google Pixel has an OLED display of 5 inches with a 1920×1080 resolution on it’s name. While watching movies or videos, Pixel 2 might win a perfect audio offer and full HD display but cannot add more pixel if required like it’s competitor S8. Leave it to Samsung to launch the best and sophisticated displays in the world. Both devices have the octa-core Snapdragon 835 chipset but the Europe and Asia Galaxy 8 has an Exynos processor. According to statistics, the new Android 8.0 Oreo Operating System run in the Pixel 2 beats that of S8. Oreo is designed to optimize and save power as well as boost the booting speed. On the other hand, Samsung Galaxy S8 runs with the Android 7.0 Nougat which is slower than Google’s Pixel 2 OS. There is nothing disappointing than a long-lasting battery and a clear company to capture beautiful moments. Google prides itself on its newest invention Pixel 2 that was released on October 19, 2017. It has a 12-megapixel rear camera with a 1.8 fast aperture shots accompanied by an electrical and optical image stabilizer which gives it a competitive advantage over all other smartphones. The front camera sports 8 megapixels as well as a f/2.4 shooter for sharp selfies. However, it does not compare with the 12 MP rear camera possessed by the S8. It’s fairly wide with a 1.7 aperture which is similar to it’s front camera that has 8 megapixels. Unlike Galaxy 8, the Pixel 2 has a tendency to blur out backgrounds for a clear image. They are both neck to neck when it comes to battery. While S8 sports a 3000 mAh battery, Google’s product has 2700 mAh to it’s name. Small batteries don’t necessarily mean a short lifespan; in fact, they are reliable despite how you use them. On daily basis, the lack of big screens and sophisticated displays compensates for power saving. The starting price for Samsung Galaxy 8 is US$ 724 while Google’s Pixel 2 is US $649. It will take time for Google to offer discounts but the S8 will see a fall in price over the next two years up to US $570. Also, Samsung has recorded numerous deals and offers that go as far as buying one and getting another device for free. The S8 has a lead on price competition despite being more expensive than Google’s product. The battle between the two devices is tricky since they have the same form and function; however, their capabilities and appearances to be a tie breaker which determines the winner. The world is yet to rate the Android 8.0 Oreo found in the Pixel 2 smartphone. When it comes to great photos and videos, leave it to Google to impress despite Samsung’s history of outstanding cameras. It took the world by surprise when Google joined the mobile manufacturing industry on top of offering online services. Let’s hope its record at inventing smartphones is similar to it’s top-notch web services. This is a wake-up call for Samsung to up their game because Google is more global and it’s services are widely trusted; what will stop it’s numerous followers from choosing Google Pixel 2 over Samsung Galaxy S8?